This past Christmas there were more books under our tree than anything else. It looks like JG and I know each other better than we think we do. We didn't give each other long drawn out novels, we're parents to an infant and toddler for goodness sake. Instead we unknowingly gave one another a picture book. JG's gift to me was The Squickerwonkers. I haven't had a chance to read it until now. The Squickerwonkers was written by fellow Canadian Evangeline Lilly. Most will know her as Kate from the television series Lost or more recently Tauriel from The Hobbit Triology. Being huge Lost fans and me having a love of all things Tolkien (including characters not included in the original novels), this was a great choice on JG's part. The book is written very well and although a bit dark, it contains a very good lesson to be learned. The illustrations are equally well done. 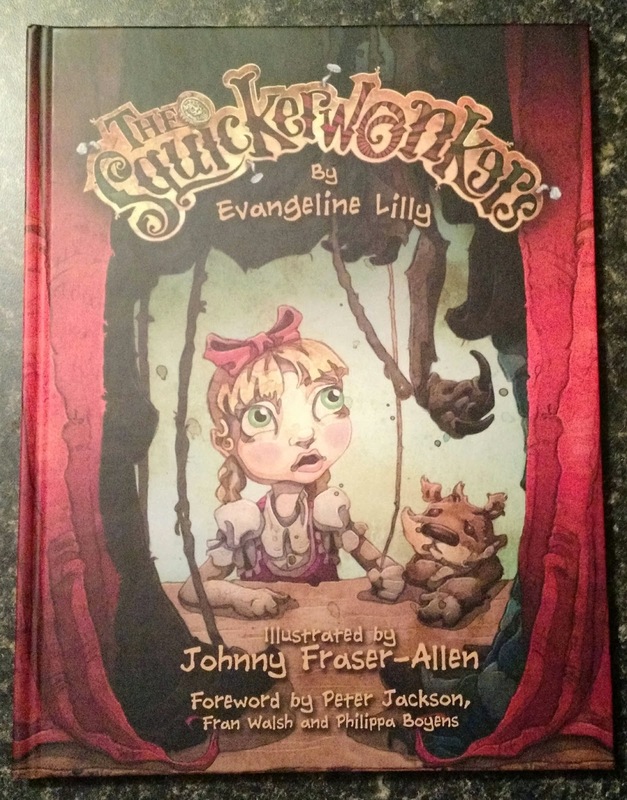 Johnny Fraser-Allen does a remarkable job bringing the Squickerwonkers to life. Each page has an enormous amount of detail. Every time I read the book I find something I didn't notice was there before. The tale begins with little Selma of the Rin-Run Royals. Selma enters an enchanted wagon and drops a coin into the machine. The coin brings to life nine marionettes known as the Squickerwonkers who we get to know one by one. We also learn that Selma is spoiled rotten, after the Squickerwonkers make her cry. Her Gramp appears and just when you think he's about to save the day, the story turns another way (Looks like the rhyming rubbed off on me...). You'll have to read the book to find out what happens next and I really recommend that you do. I'm eagerly awaiting a follow up book. The only negative thing I can say about it is it's too short. It took me longer to write this review than it did to read it three times over. I can't wait to read about what happens next to Selma and The Squickerwonkers.